It was terrific to be able to move a motion for council to formally adopt the Belgrave Town Centre Study. The study had been some time in the making and been the product of extensive community consultation. The study reviewed the previous strategic work done for Belgrave to see if it was still relevant and also considered the need for a Belgrave Bypass. The study identifies the desirable future form for the town, particularly in the key anchor locations of the current Safeway and New Belgrave Motors sites. It also talks about the sorts of treatments to make the town more accessible including the main road, railway and Alexander’s carpark. The study found that the Belgrave Bypass was not an appropriate traffic measure for the town and also acknowledges some potential sites for the location of a community hub for Belgrave. New Belgrave Motors (to the right of screen) is one of the key sites in Belgrave, it's important that some controls are in place to ensure the best possible outcome for the town. Most importantly the study recommends some rezoning of Belgrave, particularly the New Belgrave Motors site which will be rezoned to Mixed Use which allows a greater flexibility for future uses but still triggers the need for a planning permit for a ‘convenience restaurant’. 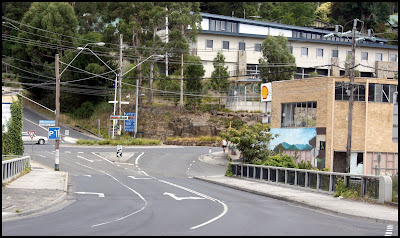 Those who’ve lived here for some time will remember the McDonalds vs Belgrave planning application. The study also suggests Belgrave is ideally placed to become a cycling hub for the hills, with the shared trail from Lysterfield to Belgrave already in the shire’s capital works program, the town would make an ideal bicycle hub. I’d certainly like to see some more work done with Puffing Billy to reinitiate talks with the tourist railway to use their rail corridor for a shared trail, something locals and tourists alike would greatly benefit from. Council only received 2 submissions to the study, both in support, which is a credit to the consultative work done to put the study together. Belgrave is a community that let’s council know when we’ve got it wrong. I was pleased that councillors unanimously supported the study and it is now a formally endorsed plan for the future of Belgrave. 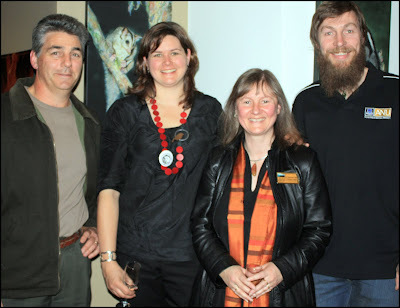 It was terrific to learn that local environmental dynamo, Vicki Boyle, was awarded the Landcare "Individual Caring for Public Land" at the 2010 Port Phillip and Westernport Landcare Awards. Vicki Boyle, Cr Samantha Dunn and Greg Coventry in front of "Nature's Highrise Apartment Block". Greg built the wonderful Nature's Highrise Apartment Block to use as a learning tool (see blog). Greg is a great example of Vicki getting volunteers on board. Greg has been helping Vicki weed down at the trestle bridge (the bamboo on Nature's Highrise was hand weeded by Greg at this very site!). Vicki has been talking to him about an idea for a learning aide to help teach people about the importance of tree hollows. From their conversation Greg built Nature's Highrise, which will be a great tool and a lot easier to carry around for the Southern Dandenongs Landcare Group than a bonafide tree hollow. Vicki was nominated for the award by her peers in Landcare and I was pleased to assist by providing a letter of support. Vicki works tirelessly in our community, relentless in her passion for the environment and enthusiastic in harnessing the energy of others to work alongside her. 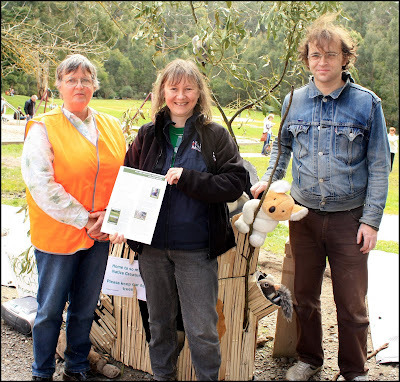 Vicki has been weeding the area near the Puffing Billy trestle bridge for over 15 years, initially starting alone, but through her actions she's attracted interest from all sorts of people to the point she was encouraged to start a friends group, which has evolved into the Southern Dandenongs Landcare Group. 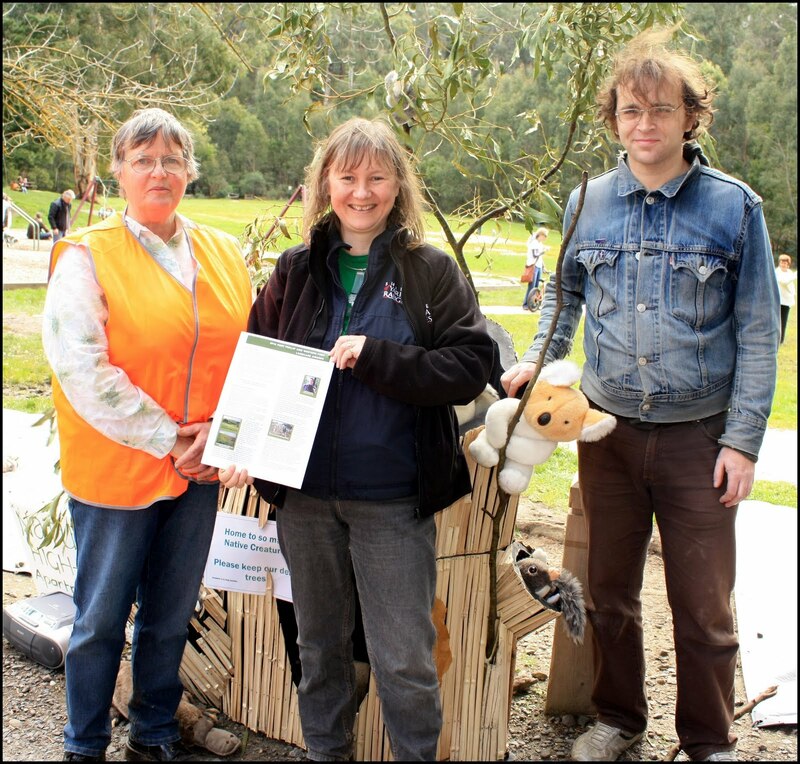 She has worked around the Monbulk Creek region, throughout the Dandenong Ranges and in fire affected regions assisting with revegetation efforts. She has encouraged others to start Friends Groups along the Monbulk Creek to spread the enormous work load and ensure that no one is overburdened with task of tackling weeds in our environment. She is truly the silent achiever, never one to blow her own trumpet and humble in her award by recognising all the volunteers who've helped along the way. Congratulations Vicki, you are a credit to our community and our environment is a healthier one due to you passion and persistence. With the Municipal Association of Victoria (MAV) State Council Annual Meeting coming up it was time for the Yarra Ranges Councillors to consider what motion we might put forward to be supported by other municipalities across Victoria so it can be advocated by one of local government's peak bodies, the MAV. This time round councillors unanimously voted "that the Municipal Association of Victoria continues to actively lobby the Minister for Local Government to conduct a review of the pensioner rebate concession with a view to increasing the concession amount". It is very difficult for those on pensions with a fixed income, it is a real struggle as the cost of rates and utilities such as electricity, water and gas continue to increase and we see these people spending greater proportions of their incomes on these costs. A review of the current pension rebate is well overdue as increases to the rebate over the years have failed to maintain pace with the increase in costs. I hope that councils across Victoria support the Yarra Ranges Council motion at the next MAV State Council Annual Meeting, the issue is critical and needs the full weight of the voice of local government pushing for a better deal. At this week's council meeting councillors had to consider the findings of a report into our shire's preschool sector to deliver the 15 hours minimum preschool commitment, COAG's Universal Access to Early Childhood Education which is due to commence in 2013. This is a long report from the roundtable, it's because Early Childhood Education is something that is very important to me. 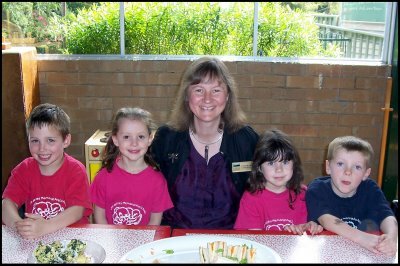 Here I am with the Len Jeffery Preschoolers, these children are getting a great start in life. Len Jeffery Preschool in Belgrave South was the first preschool in the Shire to be awarded with the Kids Go for Your Life award, which recognises healthy eating and exercise programs for children. Back in 2008 state governments committed to a policy of a minimum of 15 hours preschool for all children (taught by a 4 year degree qualified teacher) in the year before school by 2013. Yarra Ranges owns over 80% of the buildings used to deliver kindergarten programs, we also employ preschool advisory staff. Council also plays a strategic role through the Municipal Early Years Plan. A number of key issues have been identified as part of the capacity assessment planning for the new minimum kinder standards. Firstly the effect on other programs, particularly 3 year old Kinder programs. The 3 year old program is quite popular in Yarra Ranges with 46% of children accessing 4 year old kinder doing a 3 year old program first. Given that 3 year old kinder is unfunded and therefore more expensive for families the participation rate shows it is highly valued by families. The introduction of the 15 hour minimum means significant changes to timetabling which has a knock on effect to 3 year old programs in the order of between one third to one half of all 3 year old places. The next issue identified is management and governance arrangements of our preschools. Many of our Kinders are run by independent committees of management, many of these committees are finding the ongoing burden and changes onerous, whilst others thrive on the challenges. The Department of Education and Early Childhood Development (DEECD) are encouraging a cluster management framework, but many of our kinder committees are reluctant to give up their local independence and ownership. With such a wholesale change of the preschool sector and a requirement that kindergarten programs must be delivered by 4 year qualified teachers, there is concern that there will be insufficient teaching capacity available. There is also the added pressure to access a pool of qualified teachers as Long Day Care will also need to employ qualified teachers due to changes to childcare regulations. A real concern is the potential effect on the most vulnerable families, particularly kinder enrolments and affordability. At the moment families generally pay 40% of the costs through kinder fees, the average fee is around $185 per term, which has consequences for families with low and/or intermittent incomes who aren't eligible for a full fee subsidy (holding a health care card). Yarra Ranges found that cost was the most significant barrier to participation in kindergarten and as a result set up the Kik Start Program in conjunction with Anglicare to provide grants to families struggling to find the money to pay kinder fees. There hasn't been any confirmation by DEECD about funding arrangements that apply after 2013, but if we saw the same ratios that currently apply parents could expect an increase in fees of up to 50%, this is a real concern as it will impact greatly on participation. The importance of Early Childhood Education cannot be underestimated and council is committed to children and support to the preschool sector as it goes through these changes. We have an important role to play in advocating for better support for Kinders and ensuring that government continues to make sure that kindergarten is affordable for families in Yarra Ranges. We want our kids to have the best start in life and good quality early childhood education is a great start. This week's council meeting had to consider a planning scheme amendment (C89), to apply a Heritage Overlay to various properties in Lilydale and Belgrave (the Beauty Bend precinct). Back in December, 2009 the Minister for Planning authorised Amendment C89 to go on exhibition. Submissions were called and a total of 8 submissions were received including a late submission by the Sherbrooke Foothills Historical Society. Six of the submissions were about individual properties in Lilydale, whilst the other two were about dissatisfaction with the amendment process in Belgrave. I moved a motion which saw 2 of the properties included for heritage controls in the original amendment be removed (in Lilydale). The motion also recommended that the submissions received be referred to a planning panel for consideration. Councillors voted unanimously to refer all the submissions to a planning panel, once this process is completed council will make a final decision on which properties to include for heritage controls. 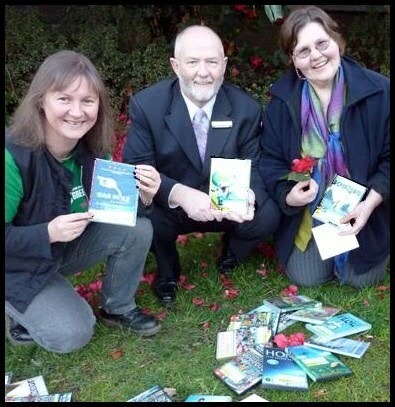 It was terrific to learn that the Shire of Yarra Ranges Sustainable Business Program has been listed as a finalist in the Banksia Environmental Awards for the "Education – Raising the Bar" category. The Banksia Environmental Awards are regarded as the most prestigious environmental awards in Australia. It's an honour to be selected as a finalist in the awards and is a credit to the Economic Development Department who work with local businesses and the Sustainable Business Program. The Yarra Ranges Sustainable Business Program assists local businesses to embrace sustainability. The program empowers companies to use new tools and thinking to drive environmentally sustainable practices in their businesses that considers people and planet, and it's good for the bottom line too. As a direct result of the Sustainable Business Program, program participants have introduced energy saving initiatives that have saved up to 3,300 tonnes of greenhouse gas emissions (not including the 2009 program). Other notable sustainable practices that program participants have introduced into their businesses include adopting significant behaviour change strategies that have allowed a number of participants to reengage with staff and strongly boost staff morale, in turn reducing staff turnover and empowering key staff to take leadership in their organisations and implementing best practices for marketing sustainability and for formulating sustainability policies that pertain to tendering for public contracts which have significant export operations. 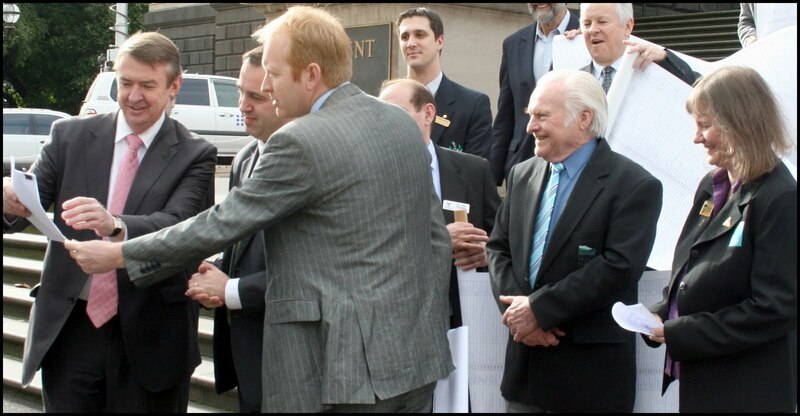 The Banksia Awards Ceremony will be held on Friday 15th October 2010 at the Sydney Town Hall. 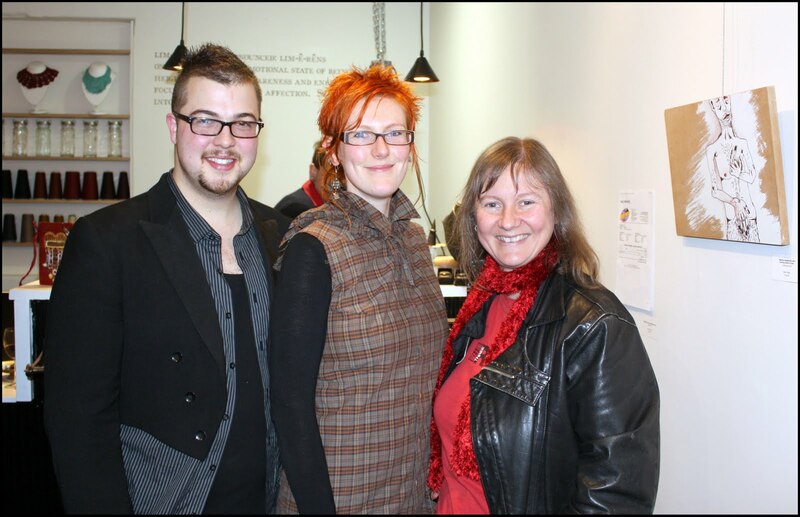 Here I am pictured with Brent and CJ, proprietors of Limerence, at the opening of their new store in Belgrave. Small business plays an important role in the Shire of Yarra Ranges and the Sustainable Business Program is one of the ways council supports small business. 59.7% of businesses in Yarra Ranges consist of only the owner/operator, whilst 28.2% employ between 1 and 4 people, combined these businesses make up a large proportion of the business community in our local economy. Limerence is well worth a visit, it is a unique retail space located at 1642 Burwood Hwy, Belgrave. Brent and CJ strive to provide an environment, which brings the local community together to celebrate all things creative. They are committed to keeping it local, and keeping it fair and aspire to provide the community with Australian, hand made fashion and jewellery, as well as be a commercial exhibition space for artisans of all kinds. It was terrific to be part of the Southern Dandenongs Landcare Group's second Awesome Ornithorynkids day down at Belgrave Lake park. 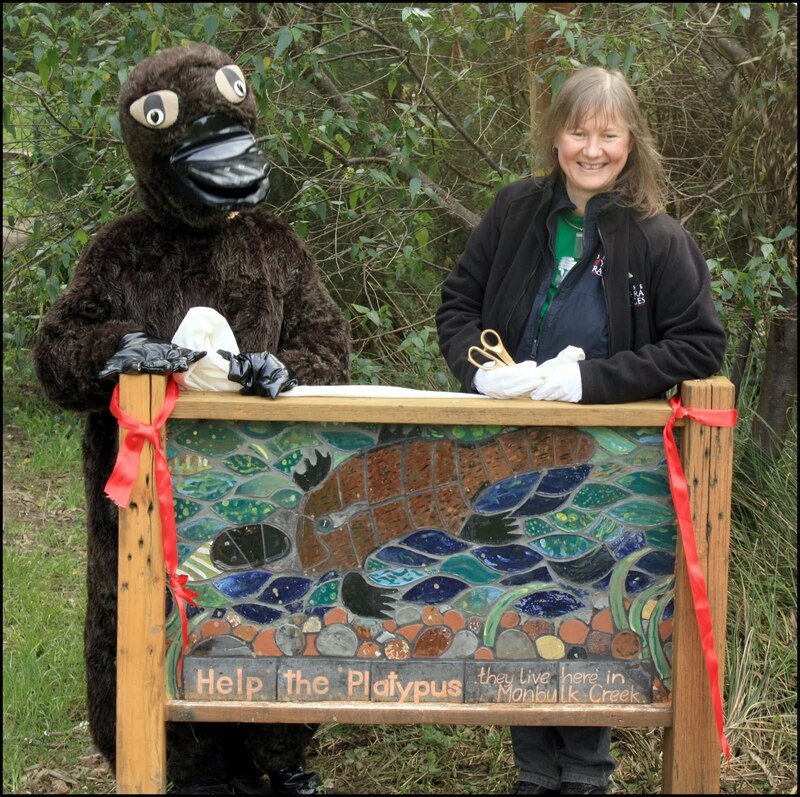 I had the great pleasure of unveiling a platypus mosaic, created by local artist Stephen Piggott, painted by local children at last year's Awesome Ornithorynkids day. Stephen generously donated the clay and paints, local woodwork sculptor Robbie Bast donated the frame while the Rowville Scouts ran the arts activity last year. It's a great example of community coming together to create something beautiful that recognises the special place we live in, where we are lucky enough to have platypus in our local creeks. The Rowville Scouts also assist the Southern Dandenongs Landcare Group in their weeding efforts by helping out in the ZigZag Road region of Belgrave South. The day also included an unveiling of "Nature's Highrise Apartment Block". Constructed by local volunteer, Greg Coventry, the 'block' imitates a hollow tree and will be used as a tool to teach children and adults the value of tree hollows and their role in providing habitat for native animals. Greg did a great job with the construction, the whole installation was made out of offcuts and recycled materials, the 'log' was finished in bamboo, sourced from weeding in the Trestle Bridge section of Monbulk Creek. Pictured left to right: Julianna De Graaf, Vicki Boyle and Cr Samantha Dunn. It was great to unveil this terrific learning tool, I look forward to seeing it around the shire. Overall the day was a great success with many families coming out to join in activities and learn more about the platypus that inhabit Monbulk Creek. The Selby CFA did a roaring trade on the sausage sizzle, selling out and having to restock to meet demand. 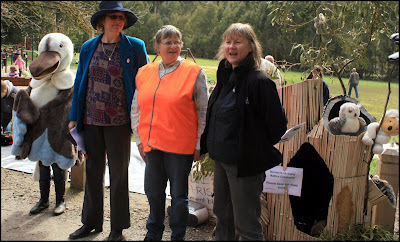 Congratulations to the Southern Dandenongs Landcare Group, it was a terrific event, they do a great job raising awareness of environmental issues. 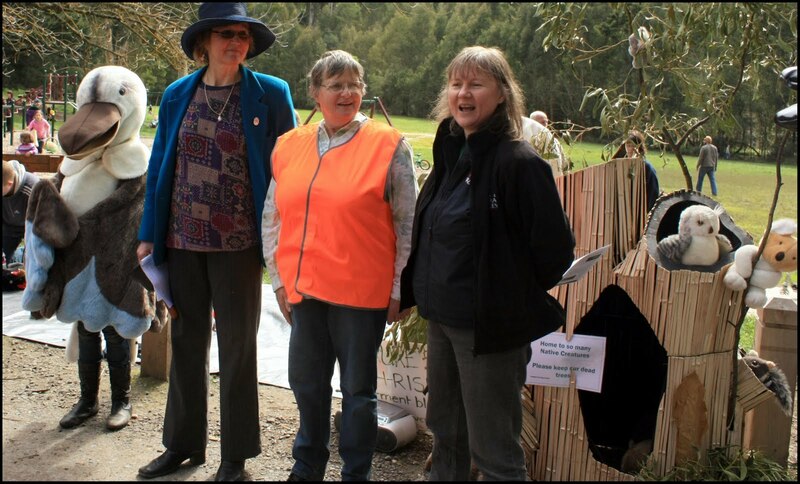 You can find the Southern Dandenongs Landcare Group at Kallista Market (first Saturday of the month) where the volunteers are always happy to give you advice. 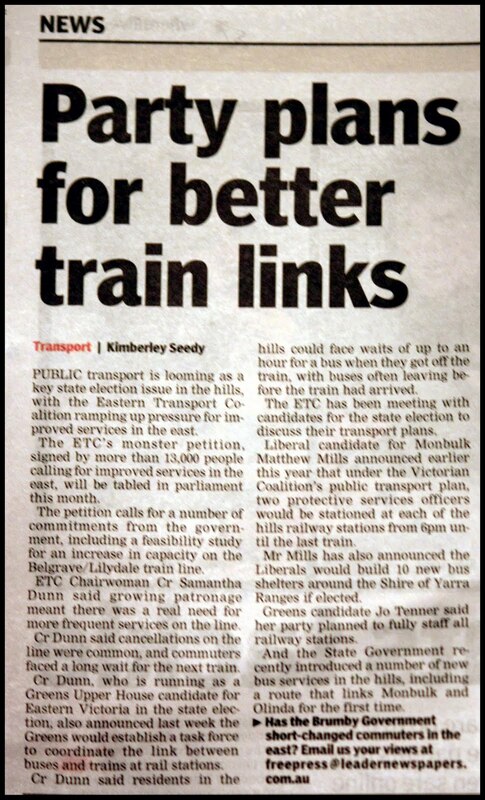 Has Brumby short-changed commuters on the Lilydale line? 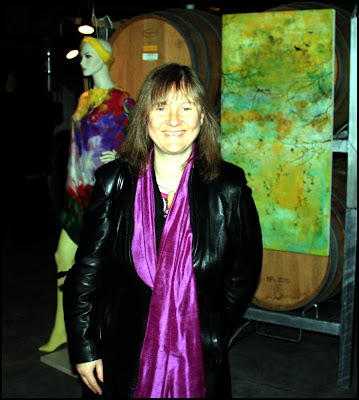 It was terrific to go to the launch of the group exhibition of Yarra Valley Open Studios at Sticks Winery in Yarra Glen. Open Studios has something for everyone, from felt artists to jewellers, sculptors to potters and of course many painters it's a great exhibition in a great location. In its second year, this year's exhibition sees 70 artists throughout the Yarra Valley throw open their doors to let the public into their private studios. It's a great opportunity to get to know the artist in their space and gain a greater understanding of the creative process. The group exhibition is open now at Sticks Winery and the weekend of 17th through to the 19th of September sees the artists open up their studio's for visitors. It's a great opportunity to see some great art in a gorgeous setting. Join me and members of the Southern Dandenongs Landcare Group for a day of family fun at the Awesome Ornithorhynkids Day at Belgrave Lake Park on Sunday 12th September. Learn how to say 'Ornithorhynchus anatinus' and find out what it means. Come and listen to a platypus expert and find out about our local population. Who to contact if you see a platypus. And why willows need to be removed. Learn how you can help and meet the big friendly platypus, Tilly. There will be something for everyone - Games, Craft Activities, Face Painting, Story Telling, Free Show bags, Native Soft Toy Play Area for the littlies as well as a guided walk around Belgrave Lake. The day will also include the offical unveiling of a mosaic project completed by the Rowville Scouts and local kids. Pictured here is the turn out at last year's Awesome Ornithorhynkids, the event was well supported by the community keen to learn more about one of our favourite locals, the platypus. You can bring along a picnic lunch or support the Selby CFA who will be there with their trusty BBQ. With the federal election counting all but final it's interesting to look at the local booths that got great Greens support. Below is a list of local booths that got more than 15% of the primary vote. It's terrific to see locals supporting the Greens, a party committed to a long term vision for a progressive and sustainable nation. Earlier this week I went to Stop Beating Around the Bush, a fundraising art exhibition, put together to raise funds for the Friends of Leadbeater's Possum to help them in their conservation efforts to save Victoria's faunal emblem, the Leadbeater's Possum. Pictured left to right: Professor David Lindenmayer, Sera Blair – President of the Friends of Leadbeater's Possum, me and David Blair – main photographer for Forest Phoenix celebrating a very successful opening night which saw a significant number of works sold to support the cause. Also there on the night was Professor David Lindenmayer, who has just published his book Forest Phoenix, which details his latest research on how the forests and the animals who live in them have recovered after the Black Saturday fires. The night was well supported by locals who attended the launch down at the World Trade Centre in Melbourne, it was also great to see so many artists, many of them locals, support the cause by donating works to raise funds. The Leadbeater's Possum is endangered, they exist nowhere else but the Central Highlands forests, Yellingbo Nature Conservation Reserve and alpine areas between Lake Mountain & Mt Baw Baw in Victoria. We are very privileged to have these amazing little creatures reside in the Shire of Yarra Ranges, but population numbers are dangerously low. Population estimates prior to the 2009 bushfires were around 2,000-2,500 individuals however post-fire estimates are at less than 1,000 with around 40 to 50% of their prime habitat lost in the fires. Friends of Leadbeater's Possum Inc was established in 2004 to give a voice to these elusive forest animals. The sorts of things that impact on the habitat of Leadbeater's Possum include logging and salvage logging, land clearing, bushfire and bushfire prevention activities like fuel breaks and fuel reduction burning. The Friends of Leadbeater's Possum group hopes to help Leadbeater's survive in the wild by encouraging conservation efforts, research programs and effective conservation strategies and policies. Earlier this week I attended the Melbourne Transport Forum Public Transport Candidate’s forum in Box Hill. Brian Tee, ALP Parliamentary Secretary for Public Transport, Damian Magner, Greens Candidate for Eastern Metropolitan and Robert Clark, Liberal member for Box Hill spoke at the forum. As chairperson of the Eastern Transport Coalition I asked the panel when the East of Melbourne would get a detailed transport plan? The Victorian Transport Plan doesn’t include any benefits for the one million people of the East of Melbourne and the reason it doesn’t is because Sir Rod Eddington’s study area never included East of Warrigal Road. I asked when the people of the East could expect to get the detailed planning, analysis and community consultation to develop a comprehensive transport plan it deserved. 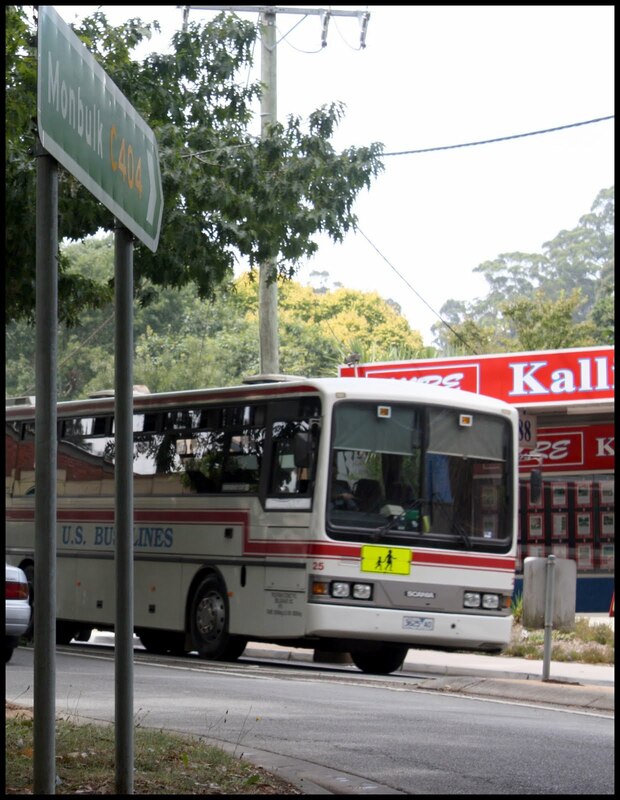 Buses are part of the answer in solving the East's public transport woes, but we need a more detailed look at all the options. Already the smartbuses are bursting at the seams with patronage. 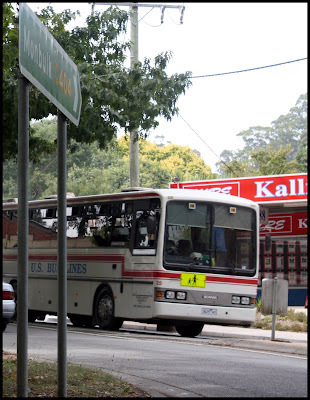 It was disappointing to hear the ALP continue its mantra of buses are the answer for the East. Brian Tee answered by talking about the recent bus service reviews as the East’s comprehensive transport planning. The bus reviews were in no way a comprehensive transport planning process, they didn’t consider other modes of transport such as rail, trams and cycling. They weren’t part of the equation. The people of the East want a detailed plan, not just an 18 stage bus service review where there is no clarity about when any improvements will be delivered. 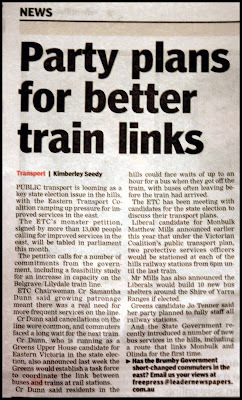 On the night the Victorian Greens committed to a feasibility study for Rowville and Doncaster rail, in an earlier meeting I had with the Shadow Spokesperson for Public Transport, Terry Mulder, he committed the Victorian Liberals to a feasibility study for Rowville rail. It was terrific to see another great initiative from the Community Harvest Project in Yarra Ranges. The group launched a set of DVDs available for loan from Eastern Regional Library branches at Belgrave, Lilydale and Healesville. The Community Harvest Project invested $1,500 received via a Shire of Yarra Ranges Community Development Grant to provide information to Yarra Ranges residents on food-related issues associated with climate change, peak oil and other issues. Me, pictured with ERL CEO, Joseph Cullen and Community Harvest mover and shaker Michelle Jones. Designed as a self-paced learning program which in time will work in conjunction with materials available on the Community Harvest website, the DVDs will be an easy way for people to learn about the issues and gain food-related skills to help build resilience in our community. 1. Issues - includes the highly acclaimed documentary Home - detailing the effects of climate change and Crude Impact - detailing the effects of peak oil. 2. Models for Change - include Permaculture Principles by David Holmgren, Gourmet Farmer, the Transition Towns and How Cuba Survived Peak Oil . 3. Re-Skilling - includes videos on cheese making, preserving food, vegetarian cooking, growing food and much more. It is a great initiative, well worth supporting, if you’d like to know more visit your local Belgrave, Lilydale and Healesville library.